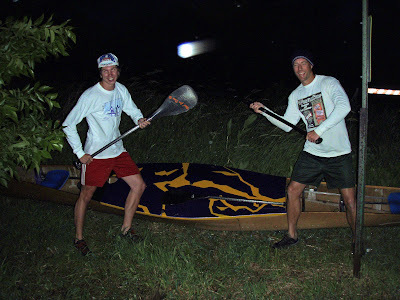 Earlier in the week Al Rudquist, Io Harberts and I made plans to do a night paddle Saturday night. During the meal after the Blackwater Barge race we were letting everyone know that we were doing a night paddle tonight. Al Rudquist told me to meet at 9:15 pm at the Steamboat Landing a few blocks downstream from the Highway 169 Bridge that goes over the Mississippi River in Grand Rapids. Joe Dunaisky told me about an LED bulb for a Mag light that he put in his flashlight that was much brighter than the standard one that I had in mine. I went to five locations in Grand Rapids before finding one for my three “D” cell mag light. These bulbs aren’t cheap, but it’s going to be nice to have a brighter light. I went back to my father’s and began to work on my light set up. A few minutes later my father came home and helped me out. Years ago I had attached the mag light holders to a piece of wood that was cut to an angle that was going to be installed on my Wenonah V1 Pro. The bow plate on the Crozer was different than the Wenonah’s so I needed an additional piece of wood to raise the light up a quarter inch or so. 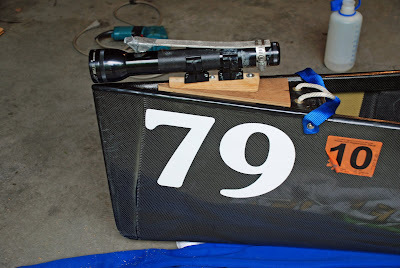 After the triangle piece of wood was cut for the top of the bow plate and another one was cut for underneath I secured the light so it couldn’t tear the thin carbon fiber of the bow plate. While working on the light set-up it began to rain hard and the wind was now blowing strongly whipping up large white caps on Pokegama Lake. I had a couple of cups of coffee while waiting for the time to leave for town. It would only take at most 20 minutes to get there. When I arrived at 9:10 pm everyone was taking the canoes off the other cars. Al said we would spot my Suburban and Joe Dunaoisky’s car at the take out point. I took my canoe off and put my paddling gear inside it. Joe Dunaisky and I followed Al Rudquist and Dan Shaffer to where we would spot out vehicles downstream. Io Harberts and Corey Meyer were left to fend for themselves in the 59 degree wet, windy weather. Al drove down the River Road to the landing that I believe was about 10 straight road miles away. Coming back to where we would start our paddle a doe ran out in front of Al’s vehicle where we just missed hitting the deer. Luckily there wasn’t a second deer. When we got back to Steamboat Landing, Io and Cory were standing on the lee side of a building to get out of the wind. Prior to the start I took a photo of everyone. I believe we all started with some sort of rain jacket or warmer long sleeve top but those quickly came off once we began paddling. We were on the water at 0947 pm. The rain held off and the wind was mostly to our backs, but there would be a couple areas in the oxbows of the Mississippi where the wind would be in our face. Al said our paddle should take us two and a half hours. Early on there was still plenty of light to run the river without lights. 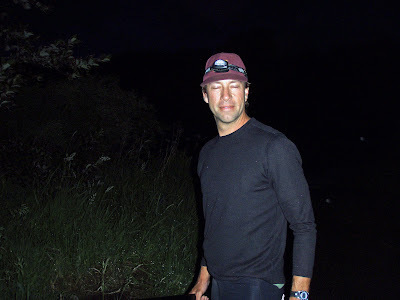 As we paddled longer there were several sections where a light was needed because it was so dark. Al knows this part of the river like the back of his hand, but there was one tree that was lying in the river that wasn’t there the last time Al paddled this section. This tree was in an area that was so dark that we had our light on so the tree didn’t pose a problem. Since Al knew the river he knew all the correct lines to run the corners. If someone was running the river at night that didn’t know it as well they would still get down the river but with more meandering. This is the same with any river that someone doesn’t know well or at all. Al told me my light was fine the way I set it up. I couldn’t see how my light was illuminating the water in front of him since all I could see is Al’s back. I could see the wide angle off to his sides and I could see the light in the trees further in front. We didn’t need to run with the light constantly, but when we would get to an area that was totally black I would ask Al which way to go. I remember in 2000 when I did the AuSable Canoe Marathon with Al DuBois there were times why I was in the stern I couldn’t tell which way the AuSable River would turn. I would say, Al which way and he would reply, I don’t know! Sometimes we wouldn’t know which way to go until we got there and then to complicate things there would sometimes be a sweeper that we would need to maneuver around. I remember being totally focused during the whole night while on the AuSable and that the night seemed to pass quickly but it was also mentally exhausting. Tonight, Al Rudquist would say some things about the river such as a cut coming up or we are going on the inside of a tree off the point. Of course, I couldn’t see these things until we were just about upon them. The river gives you a whole different perspective while paddling it at night. Hopefully what ever you find on the water you have enough time to react to it safely. This is one reason to practice paddling at night. 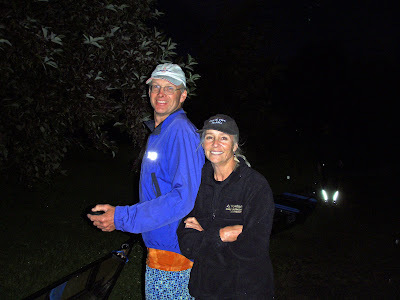 One aggravating factor when doing a night paddle is when a canoe behind you keeps their light on. This bright light bounces off everything blinding you so you can’t see in front of the canoe. If the person in front of you is wearing white clothing this really causes a problem. It’s a good idea to wear dark clothing. Last year Kate Ellis became nauseated and was vomiting because a canoe behind her wouldn’t turn off their light for three hours or so. We finished our paddle right at two hours. Al was surprised that we finished so quickly. We did have some wind at our backs but we all paddled hard tonight. Several of us talked about mentioning a head of time when the Blackwater Barge Race is held next year to plan on doing another night paddle and then another paddle on the Sunday after the race. So everyone mark your calendars next year for a week-end full of paddling. Everyone can do the race on Saturday, a night paddle on Saturday night and then a daytime paddle on Sunday. Every canoe doesn’t have to have a light source on their canoe to do the night paddle next year.